A Phantom Lite 70, 75gm frame that encourages players to ATTACK the shuttle but at the same time retain superb shuttle control. The NEW Ashaway Phantom Lite 70 racket incorporates the same dynamic features of the Ashaway Superlight family. It maintains the Hex technology; the racket head cross section is a hexagon rather than a standard oval or box shape which allows the racket to be slimmer whilst still maintaining the strength needed for tournament tensions. This slim profile and hexagonal shape increase the aerodynamics dramatically. 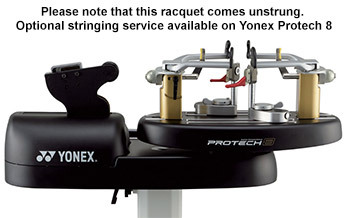 This Racket having a Low Aerodynamic Drag, and handle the tension up to 33lbs. The racket is Made up of Fullerene Carbon. Overall the Ashaway Superlight 10 Hex Frame Badminton Racket is a great choice for the beginners/intermediate players. Or perhaps a type of players that are looking for easy power and a fast swing speed.